Michael and K.I.T.T. investigate the murder of a young army lieutenant's father, and stumble upon a plot to sell tactical nuclear weapons to a foreign power. 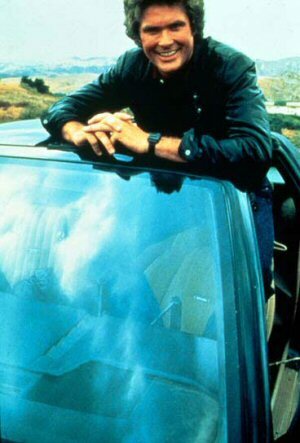 Guest star Alan Oppenheimer remembers Knight Rider: "I did two [Knight Riders]. I did the very first one [after the Pilot Episode], and another one a couple of years later [Custom Made Killer]. I still see David Hasselhoff in restaurants around town. He's a very nice guy, a very bright guy." This is the only episode outside of the Pilot not to feature Richard Basehart's narration over the opening titles. K.I.T.T. 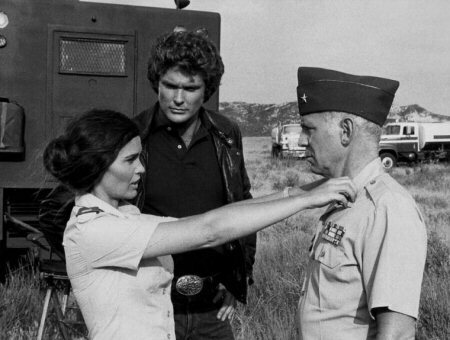 's alpha-circuit is damaged after an incident in which he tows Lt. Ladd's car. In Season Three's episode K.I.T.T. Vs. K.A.R.R., K.A.R.R. suffers a similar problem after resisting a tow on the beach. 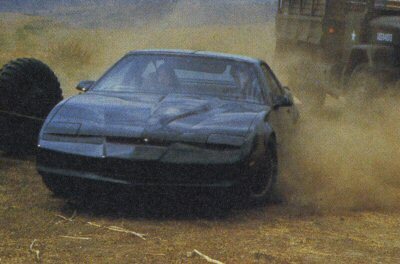 Plans to include the towing scenes in the episode were scrapped after the K.I.T.T. car broke down several times during filming! Lt. Rainey finds the following cards in Michael's wallet: "Michael Knight, Speedy Repairman"; "Michael Knight, Quick Carpet Cleaner"; "M. Knight, Enterprises - Swedish Massage While-U-Wait." 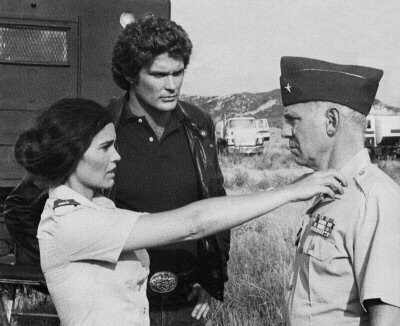 Several actors can be seen in later episodes. 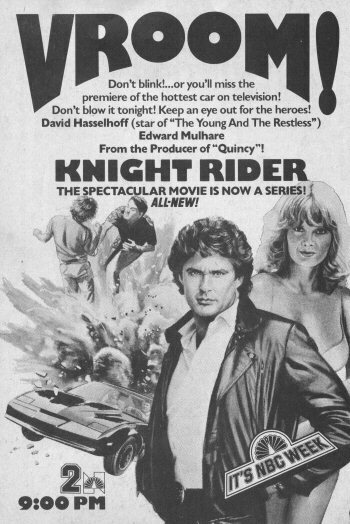 Aside from Alan Oppenheimer, Allen Williams returns in Knights of the Fast Lane and Thomas Gilleran gets murdered again in Mouth of the Snake. The early drafts feature a lot of character comedy between the stars of the show, very little of which makes it to the finished episode. Throughout the second draft script, the Foundation is trying to wrap up a union case, but the lawyers are unable to control their client -- a huge brute of a man named Mr. Feltzer. In an amusing twist, it's Devon who manages to overcome him. All references to this scenario are cut in later drafts in favor of Michael and K.I.T.T. having an unspecified mission waiting. Michael makes a reference that he is still a military officer "in the Reserves...as Michael Long." The line is justifiably cut, since Michael Long is legally dead. Cpl. Webb replaced two other officers, Kosko and Weiss, who provided more comic relief. A few other interesting changes include Lt. Ladd being locked inside a "house" on the Ordinance Testing Field, and Michael using his keys to get into K.I.T.T.